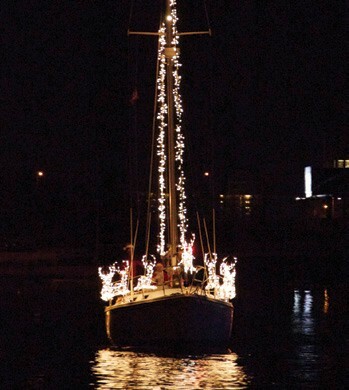 If your boat’s not hauled, haul some lights up the mast and join the fun! This popular event kicks off the City by the Sea’s holiday season. Starting at 6:15 pm, illuminated boats circle the harbor and compete for best holiday decoration prizes awarded by the Newport Harbormaster and community judges. Newport Yacht Club is open to the public that evening, and spectators can watch the parade from Bowen’s Wharf, Bannister’s Wharf and waterfront points around Newport Harbor. For more details, contact Newport Harbormaster Tim Mills at 401-845-5815 or tmills@cityofnewport.com. We are sorry to report that, due to some upcoming dredging that will be taking place in Huntington Harbor, the 2014 Huntington Lighthouse Boat Parade/Parade of Lights has been cancelled. If your sailboat, powerboat, dinghy or high-speed rowboat is still in the water, sign up for some festive fun. At 6:20 pm (after the tree lighting in Mystic River Park), decorated vessels will parade down the Mystic River and return to the park, where spectators and judges will be gathered. Boats will be judged on creativity and team spirit, with prizes for “Most Charismatic Crew,” “Innovative Vessel,” “Best Dressed Vessel,” and “Miss Mystic Vessel of Grandeur.” The entry fee is a toy or a new or like-new coat to be donated to the Pawcatuck Neighborhood Center after the parade. Register at mysticchamber.org, and call 860-572-9578 to learn more. Join us for a decorated boats A Lighting at the Dock. Bring your decorated boats to the dock slips at Crab Shell. You can come over earlier, and stay overnight as well. We have plenty of slips available. At 6:00pm we will light up the boats and let the festivities begin. Dan and Stu (outside bar) will be open with the heat lamps, fire pit, and of course we’ll have Live Entertainment. Plus, inside. Marines will be collecting Toys for Tots (and taking selfies). Please spread the word and plan on coming here Saturday – Nov 29th from 5PM until. It promises to again be a fun part of Thanksgiving Weekend. Visit Crab Shell Restaurant’s website for directions. This community carol sing and boat parade starts at 4:30 pm at Essex Town Hall with a lantern-lit stroll down Main Street accompanied by the Sailing Masters of 1812 Fife and Drum Corps and an antique car parade. The stroll ends at the Connecticut River Museum, where there will be a parade of holiday-themed boats. Santa Claus will arrive by boat for visits with children. Admission is free. For more information, call 860-767-8269 or visit ctrivermuseum.org.